FORWARD OPERATING BASE THUNDER, Afghanistan -- TOA: a Polynesian word for "warrior." This could not be a more fitting word for members of the Cross Functional Team Warrior, 1st Brigade Combat Team, 10th Mountain Division (LI), after the transfer of authority ceremony, or TOA, held Feb. 13 at Forward Operating Base Thunder in Paktya Province, Afghanistan. 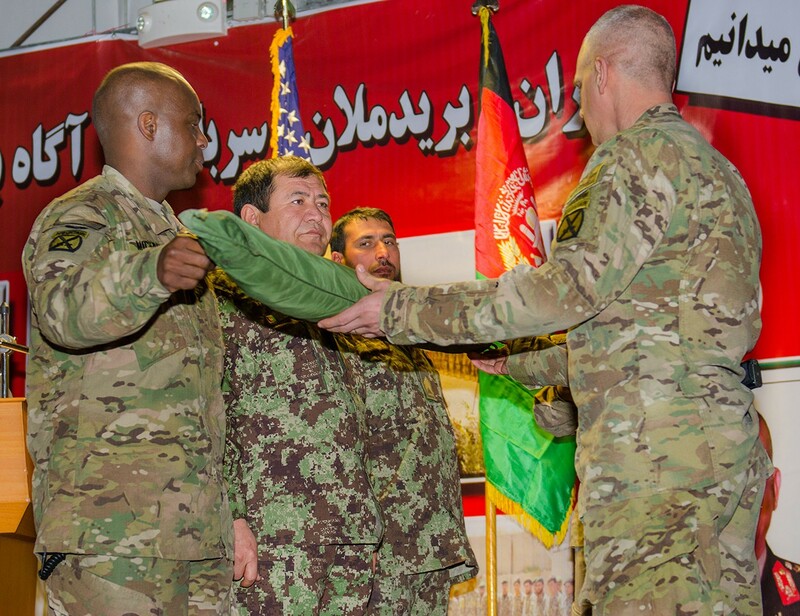 This transfer of authority ceremony marks the first time U.S. forces have transferred authority to Afghan National Security Forces in Ghazni Province. "Typically, we transition authority from a U.S. force to another U.S. force. What was significant about this last transfer of authority is that the transition was from 4th Brigade Combat Team, 1st Infantry Division to the 3rd Brigade 203rd Corps (Afghan National Army)," said Col. Stephen L.A. Michael, commander of Cross Functional Team Warrior, 1st Brigade Combat Team, 10th Mountain Division. "So now they are officially in the lead; it's their mission. They are in charge of Ghazni. We are in the advise, assist and enabling role, but it is their mission all the way." With the ANSF in the lead on all security operations, the focus of the Warrior Brigade is to advise and assist their Afghan counterparts in order for them to build on the successes and competencies they have made up to this point and to ensure their self-sufficiency after U.S. forces pull out of Afghanistan. "Our primary mission is to advise the ANA to become self-sufficient. One of our secondary missions is retrograding and redeploying our forces and equipment that has been staged here for 11 years," said Command Sgt. Maj. David Martel, senior enlisted adviser of Cross Functional Team Warrior. The redeployment process will be rigorous, but the transfers of forward operating bases to the ANSF, or the complete closure of FOBs, will be done with tedious care, returning the previously occupied land to its original state or transferring the FOBs over in good operating condition. "The goal is to transition everything that the Afghans want. In reference to our FOBs, we will transfer it to them or break everything down, leaving their countryside just as it was before we arrived," Martel said. "We came here and got it done, and (we) did it the right way," Michael said. "Now we are getting ready to redeploy. I say 'redeploy,' because we have accomplished our mission. We're leaving in our own terms having set the condition so the Afghan National Security Forces can secure their own country and that the government of Afghanistan governs its own people." The anti-Taliban movement throughout the Ghazni Province is ever-growing. Local tribes are becoming more cognizant of the Taliban's brutality, disrespect of their elders and disregard for the prosperity of their children by not allowing them to go to school. Tribal leaders and their tribes are standing up against the Taliban to ensure security and prosperity for their respective neighborhoods. "I've got a lot of confidence in the Afghan National Security Forces," Michael said. "The biggest thing that gives me confidence right now is that (members of) the Afghan National Security Forces are gaining the support of the people. You have the Afghan National Security Forces standing up, being selected from local neighborhoods. The Afghan Local Police represent the people." Historically, local tribes were influenced by the Taliban and in many ways supported them. "What is different than times past is they are joining with the Afghan National Security Forces," Michael said. "This is not going to be easy, but I think the security forces are committed, and the people have stood up and are saying they are done with the Taliban. With those two things coming together, I have the confidence they can pull it off and get it done." The 1st Brigade Combat Team, 10th Mountain Division has earned itself a distinguished history because of its involvement in many U.S. conflicts and humanitarian missions and because it was one of the first units to enter Afghanistan after our nation was attacked in 2001. "I think our role is critical," Michael said. "If you go back through the history of this brigade when this nation first came to Afghanistan, 1st Brigade was part of that original force. I think it's fitting that we are right here at the end as this closes out." Soldiers of 1st Battalion, 87th Infantry Regiment, 1st Brigade Combat Team played a significant role at the beginning of operations here in Afghanistan. Operation Anaconda was the first large-scale battle in Afghanistan involving conventional U.S. forces; 1-87 Infantry and the 1st Brigade Combat Team played an integral role in the success of that operation, just as they are doing now towards the end stage of operations here. "I am proud to be here with 1-87 Infantry," said Lt. Col. Daniel S. Morgan, commander of Task Force Summit, 1st Brigade Combat Team, 10th Mountain Division. "It was one of the first battalions to come in to Afghanistan, and now we are here at the tail of end of the war. It couldn't be a better way to finish it off." Soldiers throughout the brigade have expressed their pride in being part of this historic mission, and commanders and sergeants major could not be more proud of them for their hard work thus far and their motivation to succeed. "I'm very proud of the task force right now," Martel said. "We've got a lot of great young men and women here who've come into a challenging time to shift from a 'shoulder to shoulder' position with Afghanistan to stepping back to help the Afghan National Security Forces to lead in every aspect of their mission in becoming self-sufficient." The same pride is evident as seen through the actions of the ANSF soldiers and their commitment to provide a secure and stable environment for the Afghan people they serve. "The 2nd and 3rd Brigade (203rd Corps) have achieved irreversible progress, and the ANA are now firmly in the lead," said Maj. Gen. William C. Mayville Jr., commanding general of Combined Joint Task Force-1, Regional Command East, 1st Infantry Division. "They have proven their ability to secure two very critical provinces. The Afghan people now look to the ANA, ANP (Afghan National Police), the (Alternative Development Program) and the Afghan Local Police for their security; they have not been disappointed." 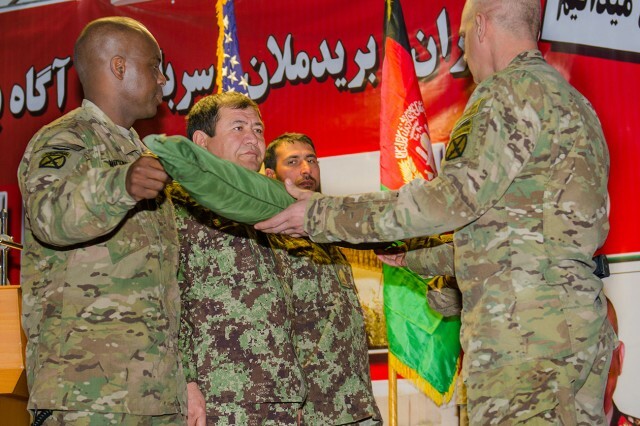 During the TOA ceremony, the Regional Command East commanding general of spoke highly of the efforts ANSF members have made this past year, conducting a multitude of brigade-level operations, disrupting the Taliban network, securing major highways, securing the expansion of the Muqor bazaar from 200 to more than 2,000 shops and route clearance companies having cleared more than 120 improvised explosive devices. "You have an important advisory mission ahead of you in the next nine months," Mayville said, addressing the CFT Warrior command group. "I know you will continue to support our great Afghan partners as they continue to take the lead in security." Soldiers of CFT Warrior have trained diligently for this unique mission. They will carry out their orders just as they have done in many operations past, writing a prominent chapter in the history of U.S. and allied forces efforts here in Afghanistan.